I can’t see how long this stalactite is, but it’s definitely growing under a bridge somewhere in Tennessee. The people at John MacKay’s site won’t tell us where exactly, because people would go there on purpose to break it off. This page is really cool with a bat caught in a stalactite (how long could that have taken, since the bat didn’t rot away?) along with an 11 foot long stalactite/stalagmite formation that’s only about 40 years old! ICR has an article that talks about how quickly things can be petrified. If you’ve ever been to the Grand Canyon or read a book about it, you will have heard that the Colorado River carved it all out slowly over millions of years. Is this even possible? 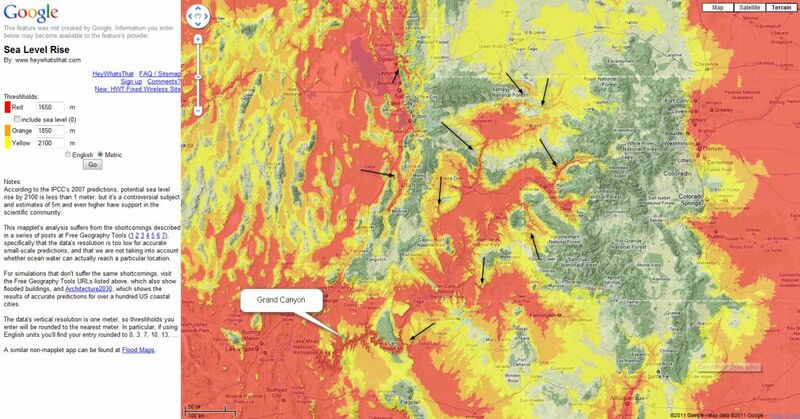 Have your parents help you read this map of the area around the Grand Canyon. Red means lowlands, and the paler the color the higher the land in that area. If a lot of water were dammed up in the middle of the picture, how could it escape from its valley? There’s one spot just north of the Grand Canyon almost low enough, but not quite. The only way out of its prison was to shoot through that narrow gap.The funny thing is that the Grand Canyon’s gap punches right through a rise in the land. For more on how that could have happened see the free technical book by Dr. Walt Brown. For you older folks his ideas and studies are fascinating! Dr. Walt Brown was the first to recognize that there had once been huge lakes up there (the area is still full of petrified trees which need water to form) and that the Grand Canyon is a dam breach. Remember this video of a dam release in Washington State? This event was WAY smaller than the breach that led to the Grand Canyon! And that was tiny compared to the devastation the world-wide flood caused. In the video you can see all the mud that water like this can carry. They were moving too fast to lay down layers of sediment there, but somewhere near or just into the ocean, all that dirt would be let down and form a delta like the ones we see at the ends of rivers around the world. What do you think? Little river over millions of years, or big lakes flowing out really fast? This entry was posted in Geology, Scientific Predictions and tagged Flood, Grand Canyon, petrification, Prediction, Stalactite, Uniformitarianism.